This article is about the regional television news programme formerly known as Channel Report. For the defunct television news channel, see ITV News Channel. ITV News Channel TV (formerly Channel Report) is the regional news service on ITV Channel TV. The news service is produced from the main studios of Channel Television in St. Helier, Jersey. The main 6pm programme is presented by James Webster and Emma Baker. Reporters and camera crews are also based at Channel's Guernsey studios in St Sampson's. 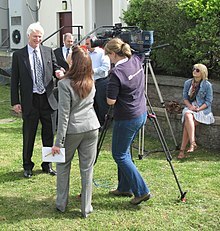 Freelance correspondents, camera crews and video journalists are based on Alderney and Sark. ITV News Channel TV airs on ITV Channel TV seven days a week. Three short opts air as part of Good Morning Britain at approximately 6:10am, 7:10am and 8:10am. A four minute lunchtime bulletin, following the ITV Lunchtime News. The main half-hour 6pm programme, before the ITV Evening News. A thirteen minute late-night bulletin, following ITV News at Ten. At weekends, a short five minute bulletin before the early evening ITV Weekend News.